The motion above was before Dublin City Council at its monthly meeting in April. It was postponed for a month as one Councillor associated it with censorship and questioned whether it was supported by the gay community etc. The exhibition itself is by artists who are long deceased and relates to the Russian Revolution and it is meant to coincide with the 2016 celebration. It is in no way an act of censorship it is more in line with sanctions and challenges that are designed to oppose the manner in which Putin has threatened the gay community in Russia. The Gay community the world over and indeed many in society at large are absolutely appalled at the draconian measures that have been brought into legislation to suppress and oppress the Gay community of Russia. As an artist and a politician, I am wholeheartedly opposed to these measures, hence, the motion. 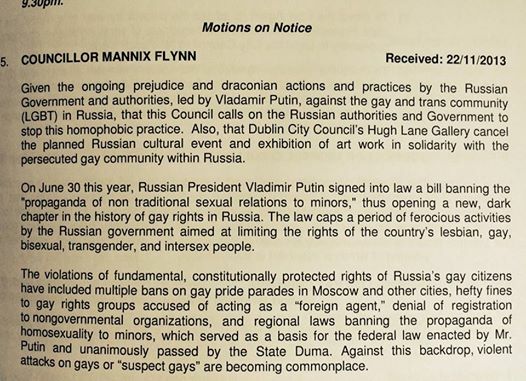 Please indicate your support by sharing this motion and if you email me mannix.flynn@dublincity.ie I will forward your support to the Council meeting tomorrow (Monday 12th May) where I will speak on this motion. Many artists from musicians to visual arts are withdrawing from scheduled concerts and artistic events such as Documenta 10 in solidarity with the Russian Gay Community. This entry was posted in community, Culture, Human Rights and tagged culture, Gay Community, Human Rights, Russian Art, TENI, Transgender Ireland by mannixflynn. Bookmark the permalink.